I’m honestly not much of a debater. Further, I don’t generally jump into a heated discussion and try to voice my opinion. But every so often, I step knowingly into the fire……just like I am once again. I’ve been cycling with music in my ears for like 10 years now. I respect the argument on each side of this debate, but I stand by what I’ve said in the past. If it’s done smartly, in the right conditions, and you’re a cyclist who is hyper aware of your surroundings…..cycling with music is perfectly cool in my opinion. Even though I feel I’ve been totally safe and respectful in all my years of cycling with music, how I do it now leaves nothing to debate. A few months ago I came across a product called Aftershokz through my involvement in the Cycling 360 Podcast. I had never heard of them before, but once I put them on and went for that first ride….I was in love. Oh, and if you know me at all….I would never pump up or recommend a product that I don’t personally believe in. 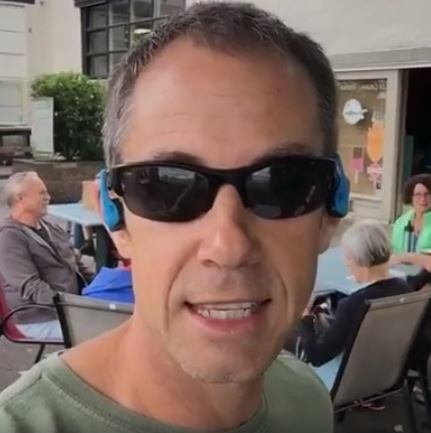 The Aftershokz bone conduction technology allows me to have crisp clean audio to listen to on the ride, but they also allow me to fully hear everything around me. I don’t even want to try to describe how this is possible. The only way you can fully grasp the beauty of Aftershokz is to take them out on a ride yourself. Yes, even you skeptics out there. (Here’s a live Facebook video of a friend of mine putting them on the for the first time, and his reaction). Don’t get me wrong. I appreciate the sweetness of cycling with nothing but the sound of nature in your ears. But I also love to ride and train with my own personal soundtrack as well. If you’re into debates, check back on my first article about riding with music, as well as the follow up article. If you’d like to enjoy riding with these babies yourself, head over to the Aftershokz website. I do stand by your statement. And, I emphasize on the words “hyper aware of your surroundings” as the key consideration in favor of riding bike and listening music at the same time. Never ridden with music before but I think I am going to try these. I have used a similar technology with swimming and this makes total sense to me. thanks for the link and the info.